Imigran is a prescription medicine used to treat migraine. It contains the active ingredient sumatriptan, which belongs to a class of medicines known as triptans. Are you currently suffering with a fever or feeling unwell? What is Imigran and what does it do? It is suggested that Imigran works by suppressing certain signals in the brain that are involved during a migraine attack. Imigran typically reduces the headache caused by migraine and decreases the sensitivity to light and sound often experienced during a migraine attack. Imigran may be prescribed if you have previously been diagnosed with migraine. 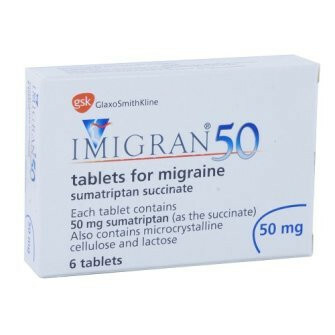 Imigran tablet are taken as soon as the first signs of a migraine attack appear. Imigran is only indicated for the treatment of acute attacks of diagnosed migraine. It is not suitable for preventing future attacks of migraine. Is Imigran suitable for my condition? The suitability of this treatment is based on a number of factors, such as whether you have any other medical conditions or take any other medicines. All orders are reviewed by our doctor to ensure the requested medicine is safe and suitable to use. You are allergic to sumatriptan or any of the other ingredients listed in the patient information leaflet. You have a heart problem, a liver disease or have previously had a stroke. You have circulation problems in your legs. You are taking any other medicine to treat migraine. You are taking medicines to treat depression, such as MAOIs, SSRIs or SNRIs. What is the recommended dosage of Imigran? You should follow the doctor’s instructions on how to take this medicine. The doses outlined below is for your reference only. Swallow the tablets whole with water, do not chew or crush the tablets. Never exceed 300mg in any 24 hour period. The recommended starting dose for the treatment of acute migraine is 1 tablet (50mg) taken as soon as you feel a migraine attack developing. If your symptoms come back after 2 hour or more, a second tablet can be taken. Note, do not use 2 tablets for the same migraine attack. Does Imigran cause any side effects? Yes, Imigran may cause side effects. However, not everyone will experience them. It is important that you read the patient information leaflet before you take Imigran to familiarise yourself with any potential side effects and allergic reactions. Pain, heaviness, pressure or tightness in the chest or other parts of the body. Feeling sick (nausea) or being sick. Yes, by letting our doctor know about any medicines you may take and any medical conditions you may have. You can do this by adding your information to the online medical questionnaire. How do I buy Imigran online? To legally and safely buy Imigran online you need a prescription from a GMC (General Medical Council) registered doctor. Our online doctor service allows you to request a private prescription through a medical questionnaire. Once you have chosen your medicine and submitted the questionnaire, it will be assessed by one of our doctors. If deemed suitable, the doctor will accept your request and a prescription will be issued. Your medicine will then be dispensed by our UK pharmacy and sent by tracked delivery to your chosen address. Your medicine is usually dispatched within 24 hours after ordering. The recommended dose is at 100 mg taken 1 a day. Dosage may vary if you are taking other anti-diabetic meds.